(AP) -- Oriental Bittersweet was an exotic foreigner still found mostly in East Asia when the New York Botanical Garden planted its first specimen in 1897. Today, it is everywhere. The shrubby vine is common in woodlands and fields in 21 states, ranging from North Carolina, to Maine, to Illinois. The American Bittersweet, meanwhile, has been in a slow decline. 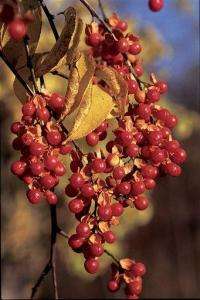 Once common across the eastern two-thirds of the U.S., the native version of the plant still is around, but it has vanished from many areas now dominated by its hardier, faster-breeding Asian cousin. "We go entire seasons now without seeing it," said Gerry Moore, director of the science department at the Brooklyn Botanic Garden. The rise and fall of the two plants has been chronicled by the Botanic Garden as part of a 20-year study that offers a dispiriting outlook on the future of some native flora. So far, the project has identified 50 native species that have disappeared from metropolitan New York during the last 100 years, and others that have become far less abundant due to factors including the destruction of their habitat, pollution and competition from foreign interlopers. In some areas, the landscape is also becoming less biologically diverse. "While you used to have a marsh of 50 or 60 species, you might now have an entire marsh of phragmites, the common reed," Moore said. The study focused on counties within 50 miles of New York City, but experts say other scientists have made similar findings nationwide. In the West, sagebrush has been giving way to cheatgrass, which found its way to the U.S. in packing materials and ship ballast in the late 1800s. Nature lovers strolling through wooded glades, thinking they are among trees that have stood since the Revolution, are actually looking at Norway Maple native to Europe. Kudzu, which hails from Japan and China, infested the South after farmers in the 1930s through the 1950s were encouraged to use it to stop soil erosion. Even the pristine open spaces of Grand Teton National Park in Wyoming are now populated with Houndstongue and Yellow Toadflax, both from Europe. Bit by bit, scientists say, the American landscape is becoming less American. "We are going to our national parks now and seeing Europe," said Tom Stohlgren, a research ecologist for the U.S. Geological Survey. "We are homogenizing the globe at a very fast rate." Experts say the trend has many causes, but the biggest one may turn out to be globalization. European traders and settlers have been bringing Old World plants to the Americas since colonization, but the process has accelerated with every advance in travel. Now, foreign species arrive so frequently aboard planes, trucks and cargo ships that the odds of the next Oriental Bittersweet arriving are exponentially greater. "That's the scary part, and the $64,000 question," Stohlgren said. "What we have had is an explosion in trade and transportation, and we have yet to see the full effect of that." "It took 170 million years for the continents to drift apart, but only 400 years to move them all back together," he said. "I describe this as Darwin on steroids, and we are going to see extremely fast changes because of it." Climate change and pollution may only worsen the problem, as they make the habitat of many native plants less hospitable, said Peter Raven, president of the Missouri Botanical Garden in St. Louis. "Obviously the loss of wild areas and their reduction in size makes it harder for natives to persist. As global warming proceeds, it will get worse," he said. The problem is one that has attracted attention both in the U.S. and globally. The Nature Conservancy, a leading environmental group, has persuaded some major home and garden retailers to stop selling invasive trees like the Norway maple and Lombardy poplar in regions. It also has been working with researchers and government regulators on developing models that might predict when a nonnative plant might have the potential to become dangerously invasive, if imported into the U.S.
Several states have established advisory committees on invasive species and a few have banned the sale of plants like the Purple Loosestrife and the Japanese barberry, both of which came over the late 1800s and are now out-competing native flora. The U.S. Coast Guard has been working on draft regulations for ballast water, aimed at preventing ships from picking up invasive aquatic organisms on foreign coasts and bringing them into North American waters. Any changes will come too late to prevent some of the native losses identified by Brooklyn Botanic Garden researchers. At the same time, camphor weed, one found only in the South, has become common throughout the metropolitan area. "There is still a lot of native diversity out there, but this is an alarm," said Troy Weldy, director of ecological management for the Eastern New York chapter of the Nature Conservancy, and co-author of the New York Flora Atlas. Species shift due to globalization, he said, "could turn out to be much more of a threat than climate change."